Hampton by Hilton Cartagena is located between the Caribbean Sea and Cartagena Bay, in the vibrant commercial and tourist district of Bocagrande, and offers easy access to all the attractions and entertainment options the city has to offer. Explore the enchanting streets of the walled city to admire colonial architecture, charming squares, and churches. Enjoy incredible views of the city and beyond from the rooftop pool and keep your workout regimen intact at the fitness center. Unwind in modern guest rooms are equipped with WiFi, flat-screen TVs and workspaces. Start your day right with a hot breakfast. 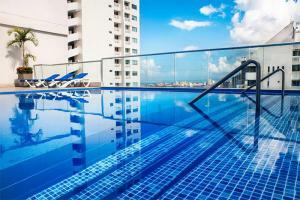 The hotel is 4 miles from Rafael Nunez International Airport, and 2 miles from Cartagena's Walls.